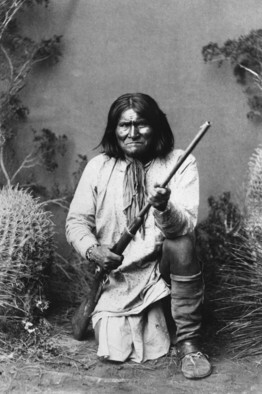 Into his 60s, Geronimo—who was about 5-foot-8 and 170 pounds—could cover 95 miles in 24 hours. Businessmen, athletes and politicians never tire of military allusions. They’re forever blowing the competition out of the water, shelling the defensive secondary or exercising the nuclear option, perhaps following up by bouncing the rubble. Prisoners, of course, are never taken. None of which is quite the equivalent of storming Omaha Beach, though it can add a touch of drama to ordinary life. A new book by college football coach Mike Leach sounds many of these martial themes, offering “leadership strategies” based on the life of Geronimo. Mr. Leach couldn’t have chosen a better brand than the Apache chief, born in 1829 in present-day Arizona. When soldiers, paintballers and boys who are allowed to play with toy guns (the few who are left) leap into battle, they do not cry “Napoleon!” “Hannibal!” or ” Nathan Bedford Forrest!” When Navy SEALs set off to lower the boom on Osama bin Laden, they do not name their mission for Omar Bradley. In such circumstances, no other name than “Geronimo” will do. That said, we’re advised not to think of Geronimo as a ruthless Chief Exterminating Officer. As Mr. Leach sees it, whites moved into tribal lands around 1851 and began a hostile takeover that eventually destroyed the Apache people. What was Geronimo supposed to do, hang around the reservation playing bingo? Such insights may not trigger a lecture invitation from Harvard Business School, but Mr. Leach’s narrative (with an assist from writer Buddy Levy ) tells the highly compelling story of a strong and resourceful people. Consider how the Apaches hunted ducks. Step one: float empty gourds toward prey until ducks become accustomed to their presence. Step two: get in water, insert head into empty gourd and drift within arm’s length. Step three: grab the unsuspecting entrées by their feet, pull them underwater for a quick drowning, then retire to the cooking fire. Live and learn, Duck Dynasty. Apache physical prowess was astounding. Modern-day footballers, who will probably soon be penalized for glaring at the opposing quarterback, would have a hard time making Geronimo’s warrior squad. Training started at an early age. “Teams of four stood across from each other in rock-slinging competitions,” Mr. Leach explains. “It was like playing dodgeball with stones.” Not everyone survived. Coach Leach, who was stripped of his command at Texas Tech for an incident of alleged player abuse that would have baffled Geronimo, hails the Apaches as the ultimate hardbodies. While modern marathoners proudly post “26.2” stickers on their car bumpers—signifying that they’ve completed that standard marathon mileage—Apache men, women and children could make 45 miles a day with everything they owned in tow or on their backs. Even into his 60s, Geronimo—who was about 5-foot-8 and 170 pounds—could cover 95 miles in a 24-hour period. These were not fun runs, of course. Geronimo and company were often in flight from armed troops, sometimes after breaking away from their reservation, where the land was lousy and the oversight humiliating. Geronimo’s final breakout, which Mr. Leach counts as one of history’s greatest evasive actions, drew the pursuit of one-fourth of the U.S. Army. Though the small band of Apaches was outnumbered 233-1, Geronimo was never captured, though he finally recognized that further resistance was futile and surrendered in September 1886. But his game was far from over, as Mr. Leach writes in bittersweet homage to Geronimo’s adaptability. Thanks to sympathetic press coverage, the Apache chief became a celebrity. Mr. Leach tells of a train ride that attracted flocks of admirers. “He’d rip buttons off his coat and sell them for a quarter,” Mr. Leach writes, “then sew more on and sell those at the next stop. His hat went for five bucks.” He eventually got into the live-Indian-performance business and rode in Teddy Roosevelt’s inaugural parade. Geronimo also became a Sunday-school teacher in the Dutch Reformed Church, though he was later booted for “incessant gambling.” He found other ways to occupy his time, marrying his ninth and final wife in 1907 at age 84. But he was never to find his ultimate peace—a return to his native lands—despite a direct plea to TR, who turned him down. He died of pneumonia in Oklahoma on Feb. 17, 1909, age 85. Even then, his war with the white man was not quite over. In 2009, Mr. Leach says, Geronimo’s great-grandson sued Yale’s Skull & Bones Society to regain possession of the great chief’s skull and other remains, which had allegedly been stolen from Yale in 1918 by grave robbers led by Bush family patriarch Prescott Bush. In a development that would probably not have surprised Geronimo, the suit was dismissed on technicalities. Mr. Leach has written a fan’s tribute to a man who, he writes, “personified a life-way of excellence.” The realities of modern life may prevent a full application of Geronimo lessons. But many of us could learn a few things from the old chief and his people, starting with a general wariness of government promises and supervision. Some of us might also look upon those 26.2 stickers with a deeply adjusted sense of awe. —Mr. Shiflett posts his original music and writing at http://www.Daveshiflett.com.